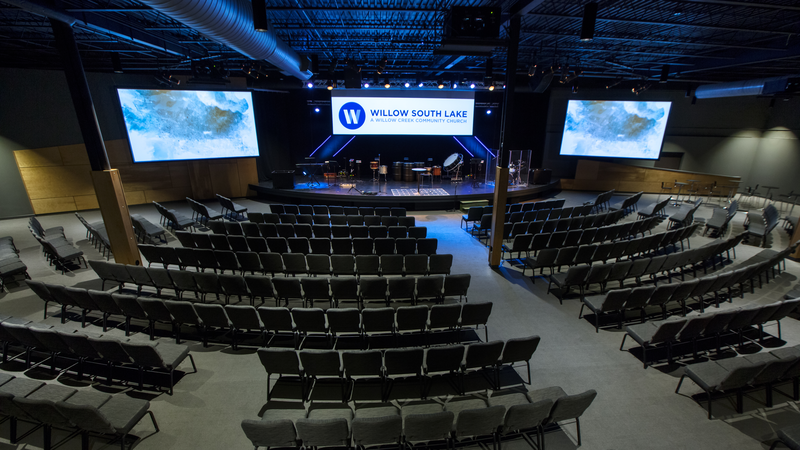 Willow South Lake moved to our current location from a movie theater in March of 2016. Most of our backbone gear was originally purchased with the intent of having it be installed in a venue once we moved to a permanent home (audio desk, video switcher, subs). In the past year, we have added intelligent lighting, on-stage Marshall POV cameras, and have been adding better speakers as budget allows (upgrading from KLA arrays that worked well in the theater but didn't work well in our new space). We are just getting into digital signage and looking into broadcast systems to clean up our remote venue experience and possibly add streaming soon. We do our best to borrow and adapt old stage sets and paint used lighting fixtures. Fun fact: there is almost no conduit in the building, pulling cable is a challenge. Our main auditorium is 120’w x 80’d x 20’h and seats about 650. Message and Video playback comes from Renewed Vision's PVS on a Mac Mini server. Graphics is ProPresenter 6 on a Mac Mini. Video sources are run through a For.A HVS-390 HS video switcher, which drives two Barco RLS W12 projectors that are shooting at 16'x9' side screens and a Barco RLM W14 projector shooting at a 24’ x 13 motorized screen that lowers all the way to the stage. 4 KLA 181 subs built into the stage. Jands Vista S1 with an M1 side car with 2 available universes. A fully staffed production team on a Sunday morning is 9 people: FOH, TD, LD, graphics op, VD, 2 camera ops, stage manager, and producer. Have more questions about Willow South Lake? Send us a note and let us know!